F.P. LOCKLIN & BROTHER, later, F.P. LOCKLIN & Co.
Francis P. Locklin, doing business under the name of F. P. Locklin & Co., a manufacturer of bracelets and cane heads, at 63 to 71 Clymer St., Brooklyn, N. Y., with a sales room formerly at 202 Broadway, New York, has made an assignment in Brooklyn to Nicholas J. White, giving preferences for $2,500. Mr. Locklin has been in business over 20 years, and formerly claimed a capital of $35,000. The original firm, F. P. Locklin & Bro., dissolved about 18 months ago. The " Co." in the present firm is nominal. A judgment for $3,278 was entered against Mr. Locklin on Oct. 20th in favor of the Umbrella Co. 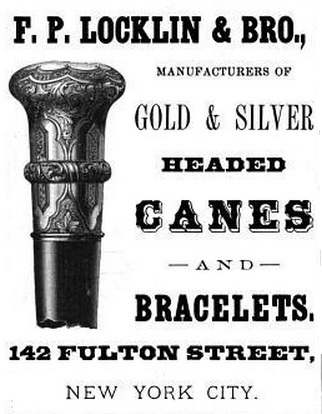 Sympathy is extended to Peter H. Locklin, a manufacturer of silverware and umbrella handles, at 142 Fulton St., Manhattan, in the bereavement caused by the death, last Sunday, of his wife, Mrs. Henrietta Knowles Locklin, at her home, 410 Decatur St., Brooklyn. Besides her husband, five sons and a daughter survive. Peter H. Locklin, Sr., head of the firm of P. H. Locklin & Sons, goldsmiths, at 36 Gold street, New York, and active in the jewelry trade in that city for forty-five years, died at the home of his daughter in Cranford, N. J., in his seventy-fifth year. Mr. Locklin was formerly associated with his brother, Frank P. Locklin, in the manufacture of gold and silver novelties, under the firm name of F. P. Locklin and Brother, but he resigned from this partnership in 1892 and formed a new one with his sons, Peter H. and John L. Locklin as members. NOTICE is hereby given, that the Partnership formerly subsisting between John Radenhurst and Joseph Stubbs, of Birmingham, in the County of Warwick, Saddlers, Ironmongers and Whip-Manufacturers, was dissolved on the 13th day of April last by the death of the said John Radenhurst; and that the Partnership (if any) subsisting between the Executors of the said John Radenhurst and the said Joseph Stubbs is this day dissolved by mutual consent; all debts owing by and to the firm of Radenhurst and Stubbs, will be paid and received by the said Joseph Stubbs.–Dated the 31st day of March 1834. Executors of the above named John Radenhurst, deceased. The business of Richard Williams. Henry Williams, of No. 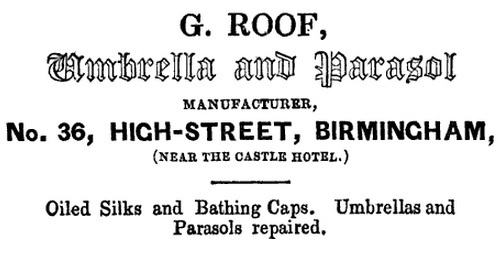 44, Ludgate Hill, London, umbrella and parasol manufacturer. 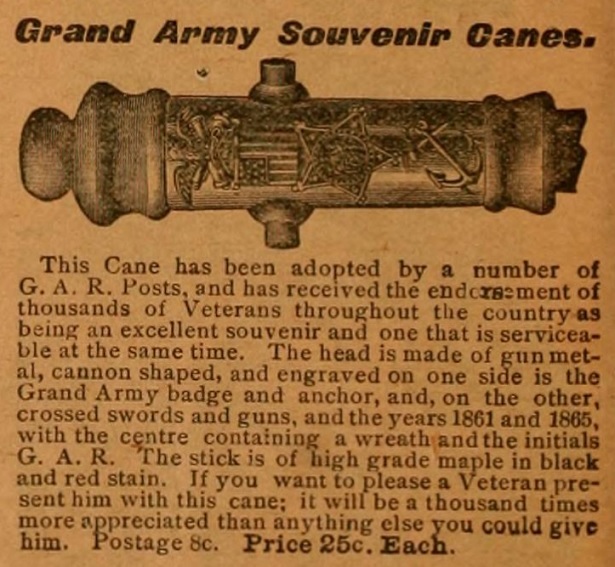 The above advertisement appeared in the catalogue of the wholesaler, Robert H. Ingersoll of New York. Julius Nussbaum was formerly in partnership with Emanuel Nussbaum until 1888. By 1908 he was occupying the Fann Street and Bridgewater street addresses. Around 1913 he disposed of the business to Alfred Edward Cross. 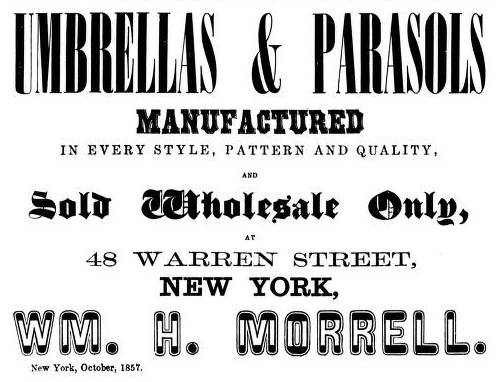 To Julius Nussbaum, of 237, Rue St. Martin, Paris, in the republic of France, for the invention of " Improvements in umbrellas, parasols, or sunshades." Julius Nussbaum entered his marks 'J.N' contained within an oblong punch, on the 12th September 1883, and 'J.N' contained within an heraldic shield, on the 12th January 1899 with the London Assay Office. He also entered marks with the Birmingham Assay Office on the 27th November 1888 and on 12th November 1903. Guldsmedsaktiebolaget were established in 1867. They merged with C.G. Hallberg in 1961, and acquired Gense (Gustaf Eriksson Nysilverfabriken) in 1964. James Robertson & Son entered their mark 'J.R & S' contained within an oblong punch, with the Edinburgh Assay Office. 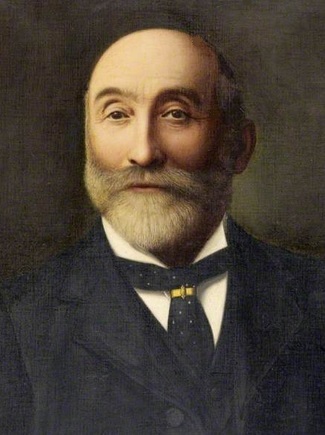 John Dickson Robertson was the sole partner in the business in the earlier part of the 20th century. SEQUESTRATION of DAVID MILLAR, Builder, Mansfield Cottage, Bellevue, Edinburgh. Edinburgh, Thomas Sloan, Contractor, Edinburgh, and James Robertson, Umbrella Maker, Leith Street, Edinburgh, have been elected Commissioners. The examination of the Bankrupt will take place within the Bankruptcy Court-room, Sheriff-Court-house, George IV. Bridge, Edinburgh, on Monday the 29th day of March current, at one o'clock afternoon. The Creditors will meet in Messrs J. & G. Smith's Rooms, No. 79, George Street, Edinburgh, on Thursday the 8th day of April 1869, at two o'clock P.M. To entitle Creditors to the first dividend their oaths and grounds of debt must be lodged on or before the 2d day of July 1869. Date of Sequestration 2d March 1869. In the Sequestration of RICHARD CRAIG FALCONER, Tinsmith and Plumber, Dalkeith, carrying on business there under the Firm of R. FALCONER & SON, Tinsmiths and Plumbers, of which. Firm he is sole Partner. Edinburgh, David Dunn, Metal Merchant there, and James Robertson, Umbrella Manufacturer there, have been elected Commissioners. The examination of the Bankrupt will take place within the Bankruptcy-court-room, Sheriff-Court-house, Edinburgh, on Wednesday the 15th day of March 1871, at one o'clock afternoon. The Creditors will meet in Dowell's Rooms, No. 18, George Street, Edinburgh, on Friday the 24th March 1871, at one o'clock afternoon. Greatly appreciate the extensive listings you posted. 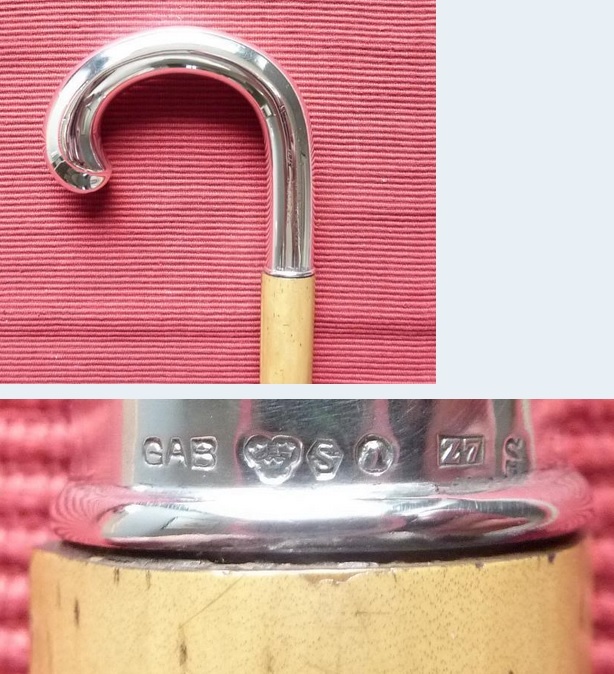 I just purchased a Ben Cox umbrella in Brighton and thought you might like to see the handle photo but I don't know how to post it here. 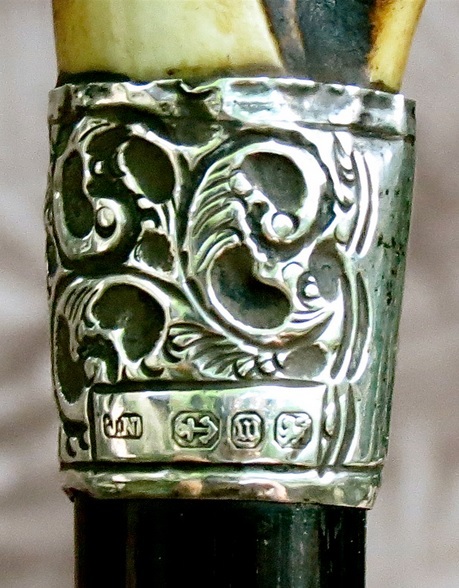 It is a full Ivory handle with an Oriental family carving wrapping around. The silk says 'NYLFRANCE FMF CYON' all around the edges. Am I correct to presume it was made prior to 1913 as the stamp on the Malacca shaft slide doesn't mention 'sons' and only says 'London Ben Cox'? Anything you can think of about this item is much appreciated! http://www.tinypic.com is recommended. Embedded images get a far greater response than just posting links. The business of William Sydney Hall and Henry Edgar Fitzgerald registered their mark 'H & F' contained within an oblong punch, with the London Assay Office on the 18th October 1899. They also registered a mark 'H & F' contained within an oblong punch with clipped corners, at the Chester Assay Office on the 31st October 1901. By 1914, Henry Edgar Fitzgerald appears to have left the business and was replaced by Edward Thurston Davies. 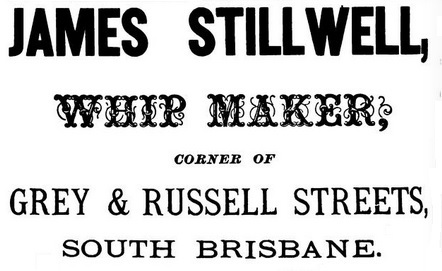 The business still continued to trade under its original name. A further mark 'H & F' contained within an oblong punch was entered with the Chester Assay Office on the 23rd July 1914. The firm also registered marks with the Birmingham Assay Office in 1904. THE CHALFORD STICK Co. Ltd. Established c.1902 and thought to be in business until perhaps as late as 1981. 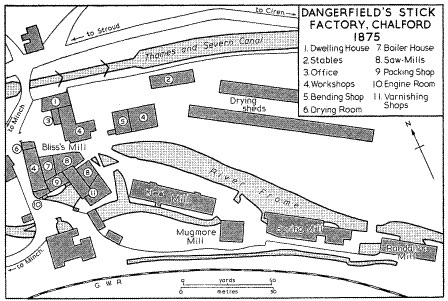 Besides their Gloucestershire factory, they had warehouses in London, Glasgow and Manchester. They also had agencies in Berlin and Paris. The owners in 1908 were identified as H.C. Daun, George B. Chell, and H. Isaac. George B. Chell was responsible for the Manchester warehouse. The Chalford Stick Co.Ltd. entered their marks with the Chester Assay Office. Firstly 'CS' above 'CL' contained within a shield shaped punch, on the 9th February 1902 (Cancelled on the 28th July 1905), and secondly 'C.S C.Ld.' contained within a conjoined diamonds shaped punch on the 28th July 1905. Established in 1840 by William Dangerfield, it was to become one of the largest and most successful stick-manufacturers in the country and at one time employed as many as 1,000 workers. Following William Dangerfield's death in 1894, the business is thought changed hands several times before it was acquired in June 1903 by a company headed by A.C. Harrison. The business had offices in London, Manchester, Glasgow, and Paris, and distributed their output all over the world. 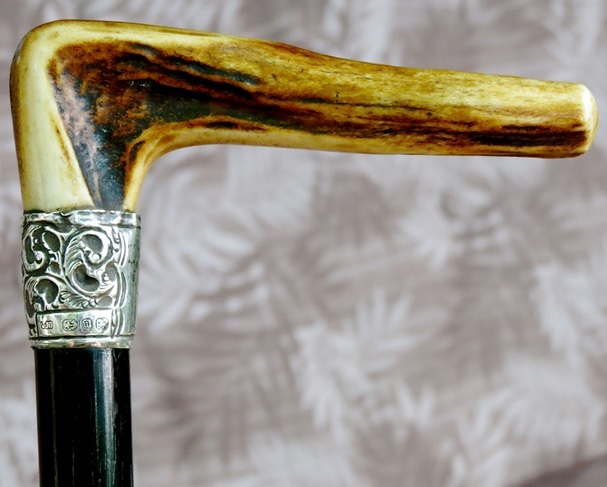 In 1912 the business was sold to Sir Alfred Apperly (d.7-9-1913) and it was later formed into a new company styled 'Chalford Woodworkers' who continued the production of sticks etc. until c. 1930. P. CONSTANTINE & SON, later, CONSTANTINES Ltd. 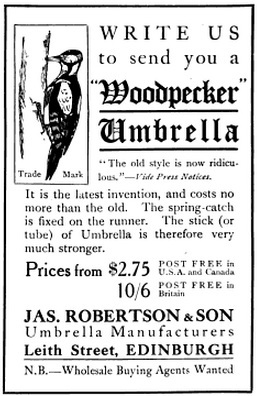 Recorded as umbrella makers in 1900. They were converted into a limited liability company in c.1905, styled Constantines Ltd. The directors noted as H. Constantine in 1905, and F. Constantine in 1913. Other addresses noted for this business, 16, 18, 20, Swaine Street, Bradford and 6, York Place, Leeds. 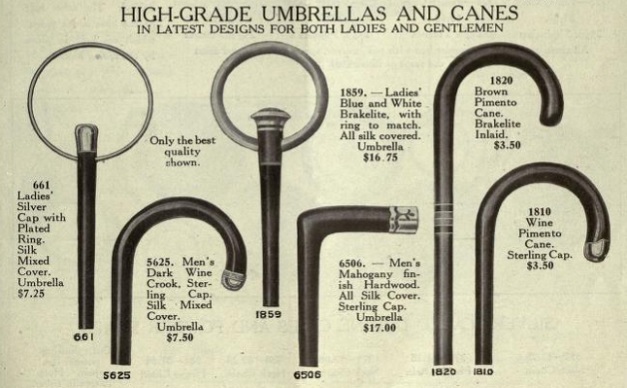 Constantines Ltd. were noted as exhibitors at the British Industries Fairs of 1929 and 1947. They registered the trade mark 'Aquachute'. As Constantines Ltd. the business entered their marks, 'C. Ltd' contained within a pennant shaped punch, with the London Assay Office on the 2nd September 1905, and a similar mark, but with a more rounded end to the tip of the pennant, was entered on the 3rd September 1913.